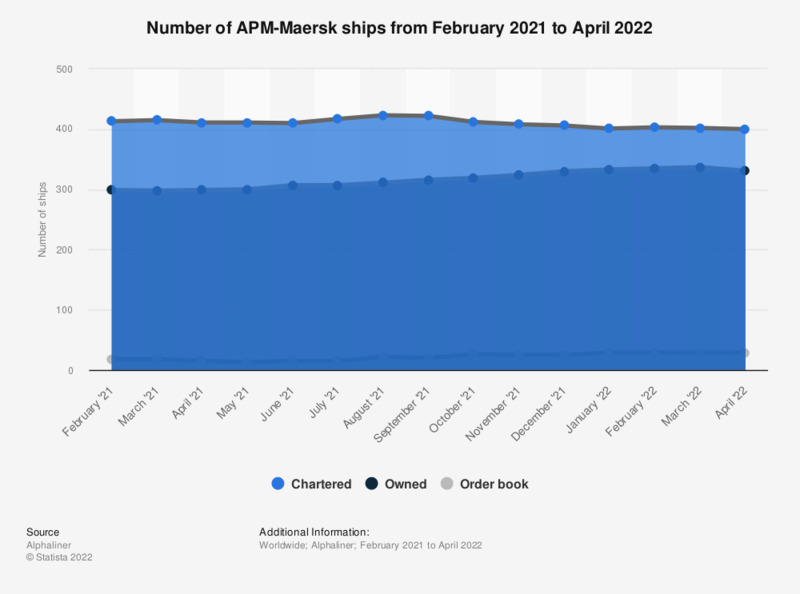 This statistic represents the number of APM-Maersk ships as of March 27, 2019. Europe's largest ship operator had 15 ships in its order book as of March 27, 2019. In terms of twenty-foot-equivalent units, Denmark’s Maersk Lines is the world’s largest container-shipping company. Twenty-foot equivalent units (TEUs) are the shipping industry’s standard unit of measure, denoting the capacity of a standard freight container. In March 2019, the Maersk Group had ships with a capacity of around four million twenty-foot-equivalent units, which could be broken down to some 2.3 million twenty-foot-equivalent units of owned capacity and about 1.7 million twenty-foot equivalent units of chartered capacity. Furthermore, the container line had ships with an additional 34,160 twenty-foot-equivalent units of capacity in its order book. Overall, the Copenhagen-headquartered shipper accounted for 17.7 percent of the world’s merchant container fleet. As of March 5, 2019, Maersk owned 316 ships, some 31 of which had a capacity in excess of 18,000 twenty-foot equivalent units. One of Maersk’s most impressive container ship is the Madrid Mærsk. The Triple-E vessel was built by South Korea’s Daewoo Shipbuilding & Marine Engineering Company, one of the largest shipbuilding companies worldwide. The megahauler is just under 400 meters long and 59 meters wide, trailing only the OOCL Hong Kong in TEU capacity. Triple-E stands for "economies of scale", "energy efficient" and "environmentally improved". The ships in the Triple-E class are regarded as the most efficient container ships per twenty-foot equivalent of cargo. However, the building of such mega ships comes at a risk as the container shipping-industry continues to suffer from overcapacity and weak global demand.